There are many variations/customizations possible, ask me for details. Adorable reproduction of a Heubach child with attached egg. The egg can hold silk flowers or maybe some easter eggs. $38.00 for the plain Heubach Child with Egg. This can be ordered with handmade porcelain flowers , painted flowers, or left plain. The porcelain flowers are handcrafted and applied in the green ware stage before the first firing. Ask me for pricing details. "Come along inside... We'll see if tea and buns can make the world a better place." 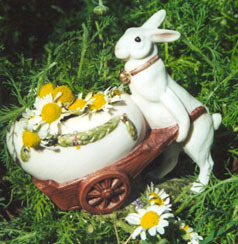 Kenneth Grahame, "The Wind in the Willows"
All porcelain rabbit pushing an open egg in a cart. This looks wonderful as a table decoration, filled with some small silk flowers, or little easter eggs. Also can be used to hold your favourite pieces of jewelry, or a little bit of potpourri. (approx 4" long x 3" tall) $25.00. 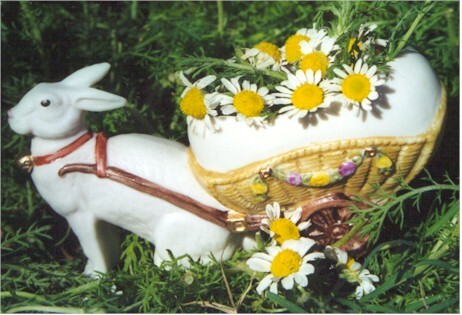 All porcelain rabbit pushing an open egg in a cart. This looks wonderful as a table decoration, filled with some small silk flowers, or little easter eggs. Also can be used to hold your favourite pieces of jewelry, or a little bit of potpourri. (approx 4" long x 2.7" tall) $25.00. 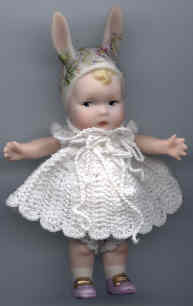 Ellie - Ellie has moveable arms with handcrafted porcelain flowers on her bodice and in her hair. 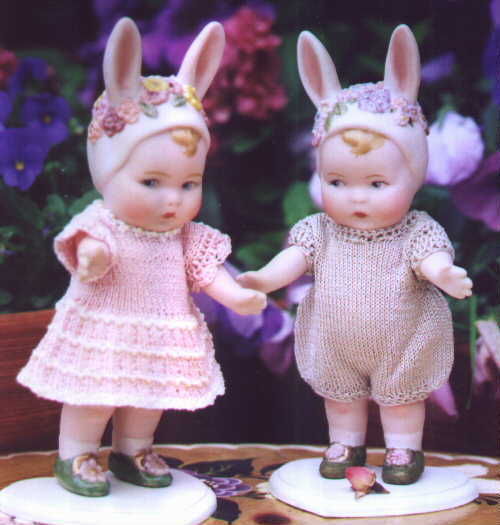 3" tall Also available with porcelain lower egg container. Antique Reproduction. 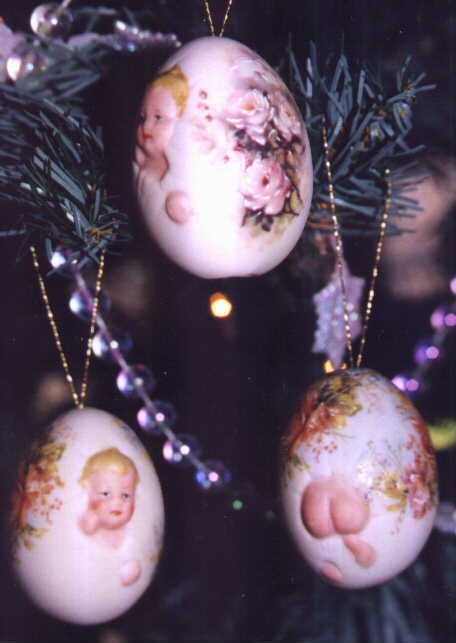 This sassy little egg baby has the head and hands coming out the front and his bum can be seen on the reverse side! The birthing egg originally came from England and was given by midwives to women in labor as something special to hold and squeeze during the birth. The eggs can be personalized with year and name. 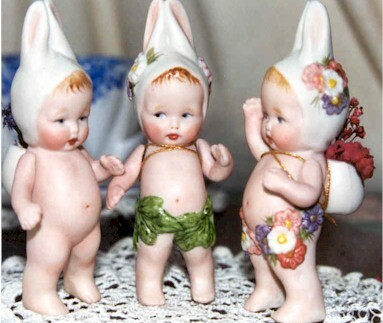 These make wonderful shower gifts and look great from your Christmas tree or Easter tree. Small hole in bottom allows for insertion of a christmas tree light to illuminate the ornament. May be ordered plain or with flowers on egg. $14 ea plus shipping. Here is the Twins version of the Birthing egg...two heads on the front and two bums on the back :) The birthing egg originally came from England and was given by midwives to women in labor as something special to hold and squeeze during the birth. The eggs can be personalized with year and name. 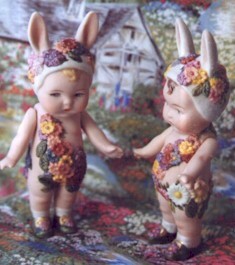 These make wonderful shower gifts and look great from your Christmas tree or Easter tree. Small hole in bottom allows for insertion of a christmas tree light to illuminate the ornament. May be ordered as an ornament or to stand alone $18 ea plus shipping.